Who grabs the #Nats last bench spot: Adrian Sanchez, Spencer Kieboom or Jake Noll? Chances are Howie Kendrick and Michael A. Taylor will both begin the 2019 season on the 10-Day Injury List as they rehab their way back to join the team. Because we are now less than 10 days until the season begins, there is probably not enough time to get ready for Opening Day on March 28th for that duo. Taylor’s injury all but guarantees that Victor Robles will be the team’s starting centerfielder, and all indications are Andrew Stevenson will be the Nats’ fourth outfielder making the bench Kurt Suzuki C, Matt Adams 1B/LF, Wilmer Difo, IF/OF, Andrew Stevenson OF, and ____________ . The remaining bench spot looks like it will come down to Adrian Sanchez, Spencer Kieboom or Jake Noll. Positional flexibility would be a plus for that last spot along with the ability to pinch-hit with some power. The other complication is that Jake Noll is not on the 40-man roster; however a spot looks like it will open up as Pedro Severino is out of out of options. Of course, Severino could be a dark horse for the last spot if the team did not want to DFA him now. The 1,000 pound gorilla in the room is that general manager Mike Rizzo could make a surprise trade, sign a free agent like Denard Span, or claim a DFA’d player for the last spot; however, a free agent pickup like Span would not be ready to join the roster immediately. While an outside move is possible, Rizzo does not have a lot of financial flexibility. When Rizzo and manager Dave Martinez sit down to finalize their roster, it is very possible that they go in a direction that nobody was anticipating, and Pedro Severino certainly qualifies as that type of move. A third catcher like Severino or Spencer Kieboom would free up the backup catcher du jour, Yan Gomes or Suzuki, to pinch hit without worrying about depth because there would be an extra catcher on the bench. There is positive for a third catcher. The positive for putting Adrian Sanchez on the bench is that he can play 3rd base, 2nd base, and shortstop, but his bat is weak. 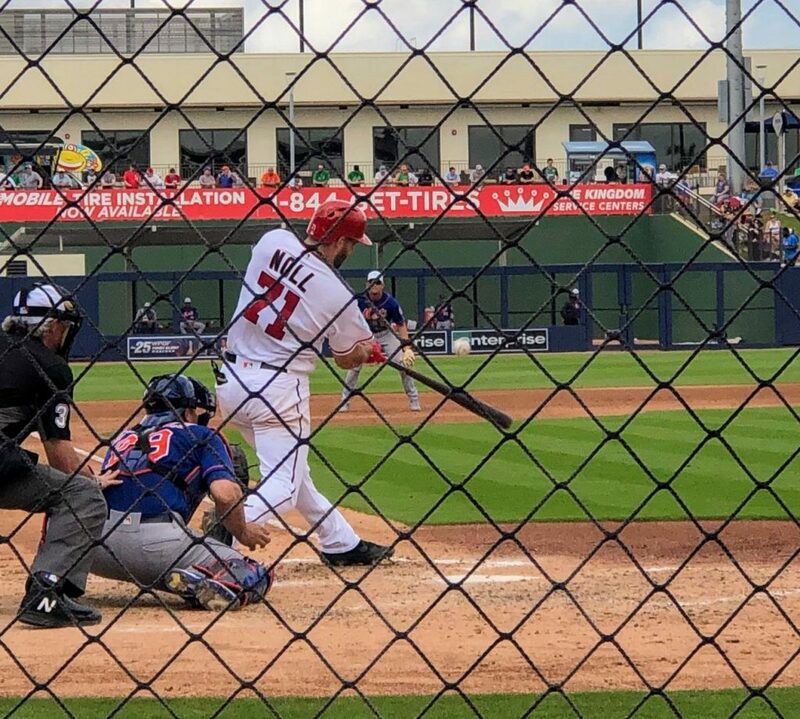 Jake Noll can play 3rd base, 2nd base and 1st base and while there is not much need for another first basemen behind Ryan Zimmerman and Matt Adams, Noll could back up Anthony Rendon at 3rd base and Brian Dozier at 2nd base to free up Wilmer Difo as the emergency 5th outfielder. One thing about Jake Noll, he has worked hard and has impressed the coaches and the fans. 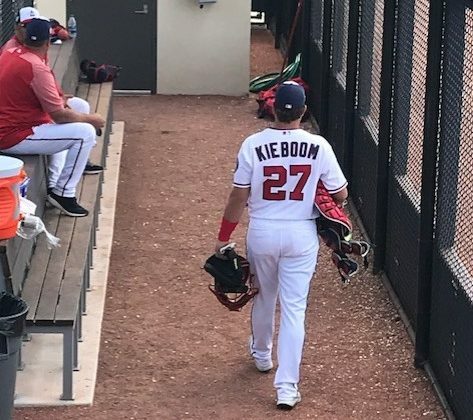 For the same reasons, some may want to bring up Carter Kieboom now, but Mike Rizzo has been steadfast in the past to never bring up a top prospect at the beginning of the season to play them off the bench. Who would you put in the last bench spot? This entry was posted in Analysis, Feature, Roster. Bookmark the permalink.